Here are the last three peeks of what's to come this month! Melissa Bickford has created an entire set of apple themed images. They come in all kinds of different sizes and patterns along with some perfectly punny sentiments! My favorites are the 2-inch apples with different two and three step stamping options like this one! Heather Nichols is adding another versatile set to the list of her Wonderful Words collection. Everyone makes thank you cards and this fresh little set with give you some new fun options when creating them! 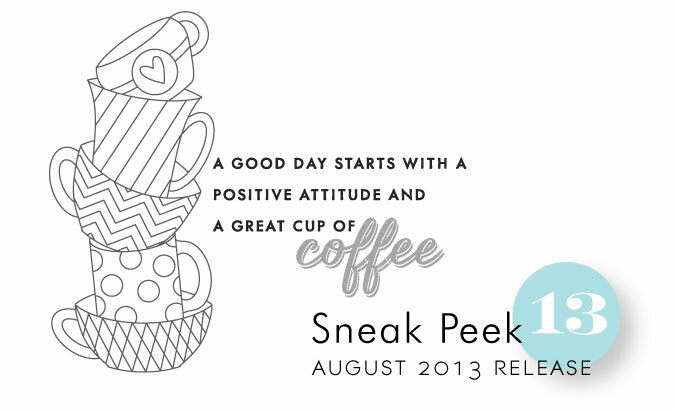 A brand new set all about coffee is the last little sneak I have to share with you today. This stacked cup image looks stunning when colored, but it's detailed enough to stand on it's own as well! The sentiments are all about coffee and will be wonderful for creating cards for friends or putting together small coffee-themed gift sets! That's it for me today! I hope you will join us again tomorrow as we begin bringing you projects and inspiration using all of these fabulous new products! Not a coffee drinker, but love the mugs. Love the coffee set idea. Will there be single mugs also? The coffee cups are DARLING! I just love it when a stamp set gives me the option of coloring images with Copics. –Takes me right back being a little girl playing with crayons and paper dolls. These are great! Love the stacked mugs and apple! I love the fresh modern look of the coffee mugs. Ooo Weeee – all three of these are something I would really like to get – love them! For a coffee addict like me that great stacked set of mugs is perfect! A few of my best friends are coffee fiends. The mugs will be perfect! Can’t wait for this coffee set, looks so fun!!! Used to mask the tea cup image. This stamp does it all for me! Plus I get to color a bit. What fun. Love Heather’s wonderful words series. This cool ‘thank you’ looks be a standout. Lovin the texture! Love the coffee theme, perfect for someone like me who loves my cuppa joe! Oh Nichole, love today’s sneak peeks. Can’t wait to go shopping…plus those mugs..brilliant and coffee themed as well, so many friends are going to be seeing this set on everything from me !! I’m intrigued by this apple set. Can’t wait to see it in action. Also interested to see what sentiments go with those mugs. The apple is so perfect and the cups are too !! Great stamps !! I love the apple, I’m sure the complete set looks beautiful. More great stamps!! Love the apple and cups! Super cute! Love the mixed fonts of Heather’s ‘thank you’. Love the Coffee set, can’t wait to see what else goes with it? I know this is going to be a must with a coffee addict like myself.!!!! Love the apple. I can’t wait!! The coffee cups are adorable! As a recently retired teacher, the Apples caught my eye… and touched my heart. ♡ It would be such fun to add apples to my cards! 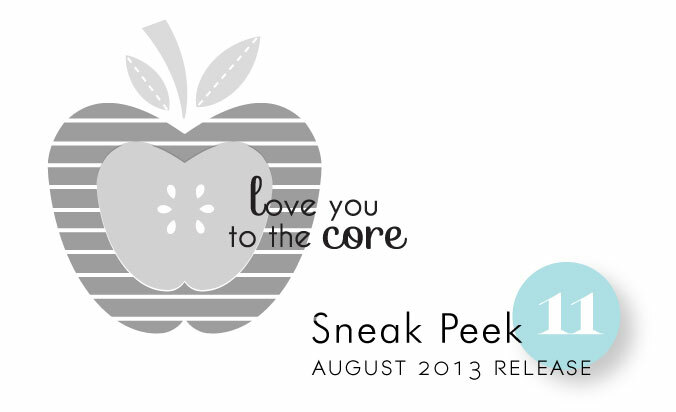 My daughter-in-law is a teacher, the apple set will be perfect to make a collection of note cards for her! This release is wonderful! Love the apple and the coffee cups!!! I’ll be interested in seeing the rest of the “Word Collection” set too! There is a coolness in the air….and looking at these new offerings warms me up! Love the coffee cups! I already have a long wish list and it is only day 5. Love the tea cups stamps!!! LOVE ALL THE NEW STUFF!